The Irish Football Association has launched a new Five-Year Strategy aimed at promoting, fostering and developing football for all. 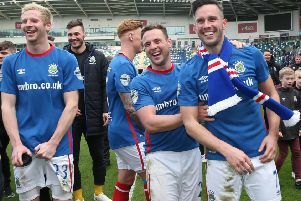 With the Northern Ireland senior men’s side having competed at EURO 2016, the new National Football Stadium at Windsor Park complete and open, more people watching the NIFL Premiership and more people playing the game, football in the country is on a high. However, in January the board of the Irish FA commissioned a new Five-Year Strategy designed to ensure that the game continues to grow at all levels and that the Association continues to deliver for the entire football family in Northern Ireland. As part of the process of writing the new strategy, the Association held consultations with Divisional Associations, NIFL, the Northern Ireland Women’s FA, the Northern Ireland Boy’s FA, the Premier Intermediate League, Championship Clubs and the Amalgamation of Official Northern Ireland Supporters Clubs. Irish FA Chief Executive Patrick Nelson said: “A new strategy was required to ensure that the legacy of UEFA EURO 2016 has an impact on every level of football in Northern Ireland. “We want to make sure that qualification for major tournaments doesn’t just happen once in a generation but is something that happens regularly for both our men’s and women’s international teams. “Additionally, we want to offer as much help as possible to our member clubs. “We look forward to the long-promised £32.6 million of sub-regional funding being released by the Stormont Executive and will work to ensure that this capital investment has a transformative effect on football at all levels. “It is also our aim that the ‘everyday game’ flourishes whether at intermediate, junior or recreational level. “It is also a priority of the Association that the National Football Stadium at Windsor Park is used for as many club finals as possible. “In short, we want to build on the foundations laid in recent years and to set new targets that will benefit the whole game in Northern Ireland. “ I believe that this plan will help us do that and I look forward to promoting, fostering and developing football for all over the next five years,” he added.